Founder of the IPF, Alain Hubert, is an engineer by training and has become an explorer and adventurer. His expeditions in the 1980's and 1990's have taken him to the Himalayas, the Andes, Antarctica and the Arctic and other remote locations. Occupation(s): Explorer, civil engineer, entrepreneur, carpenter, mountain guide, public speaker, good-will Ambassador for UNICEF, co-founder of the International Polar Foundation. Accorded the Georges Lemaître International Prize - for services to science, 2003. Awarded the Grand Officier de l'Ordre de la Couronne, Belgium, 2003. Secondary Education - humanities (Greco-roman options) - Brussels. Civil Engineer - Catholic University of Louvain (UCL) in 1977. Co-founder in 2002 of the International Polar Foundation, to raise awareness of the importance of Polar science and climate change - will set up the Polaris Climate Change Observatory in Brussels and in Toronto. Public Speaking: expeditions, climate change and environmental issues. ('Exploration du Monde', 'Les grands Explorateurs' , 'Connaissance du Monde' cycles, etc.). Expert for National Geographic polar expeditions. Management and Human Resources consultant: various seminars for Business Management. Technical consultant for the conception of material for extreme conditions in mountainous and Polar terrain: Millet (1998-2002), Lestra Sport and Haglöfs (Sweden). 1997-98 originator and co-designer of the exhibition 'The Last Continent' (The Antarctic, past present and future - what is at stake) at the Musée du Cinquantenaire in Brussels. The exhibition attracted more than 300 000 visitors. 1997-98 - collaborated in the European Polar Snow Research project in the Antarctic. With the LGGE (Laboratoire de Glaciologie et de Géophysique de l 'Environnement de Grenoble (France) and the Institut d'Astronomie et de Géophysique Georges Lemaître at Louvain-la-Neuve (Belgium). "L'Enfer Blanc", North Pole Expedition, (Éditions Labor, Brussels, 1994) - With Didier Goetghebuer and Michel Brent. "In the Teeth of the Wind", The Great Antarctic Crossing, (Éditions Labor, Brussels, 1998 - Van Hallewyck, Leuven, 1998, - Bluntisham Books, London, 2001) - With Dixie Dansercoer. "Chaos sur la Banquise", The book of the 2002 Arctic Expedition, (Van Hallewyck, Leuven, 2002 - Labor, Brussels, 2002) - With Dixie Dansercoer. "Deux pôles, Un rêve", Arthaud (Flammarion), Paris, 2004. "antarctica.org", 1998, documentary film on the Great Antarctic crossing, which won the Toison d'Or (first prize) at the Adventure Film Festival held in Dijon (France) in 1999, and the First Price of the Mountain Film Festival held in Trente (Italy) in 2001. "Chaos sur La Banquise", 2002, documentary film of the attempt at the longest Arctic crossing. "Pole to pole", multilingual DVD pack on polar expeditions with several original bonus ( film music, pictures, topics and video animation on the International Polar Foundation activities). 1960-1977: Académie des Arts Décoratifs and Académie de Musique. 1971-1978: running activities in several youth movements; joigned the Club Alpin Belge. Mountaineering (qualified mountain guide), canyoning, an avid Marathon runner, skiing, (downhill, back-country, telemark). Holds a pilot's licence for paragliding. Counsellor and teacher at ADEPS (Administration de l'Éducation Physique et des Sports), Belgium. Alain has published numerous books and articles about the Arctic and he was the originator and co-designer of the exhibition "The Last Continent" at the Musée du Cinquantenaire in Brussels. Amadablam (6858 m) - first ascension of the East Ridge, first crossing with André Georges, Nepal, 1983, and winter ascension of the Southwest face, Nepal, 1992. Kanchenjunga South (8491 m) - attempt at a solitary ascent of the Southwest face, Nepal, 1987. Cho Oyu (8201m) - attempt at the winter ascent of the Southeast face, Nepal, 1989, and ascent of the North-west face, Tibet, 1990. Everest (8846 m) - 1991, 1992, 1994, 1996 and 1999. Attempt at the ascension of the North face, Tibet (storm, altitude reached 7250m) -1991. South ridge, without oxygen, Nepal, (altitude reached 8450 m) -1992, 1994 and 1996. North Ridge without oxygen (altitude reached 8580m, climb stopped following fatalities in the group) -1999. Various climbs in the Himalayas, the Andes, Antarctica, Patagonia and Alaska, 1989-2004. Gasherbrum I & II (8064m & 8130m), Pakistan, 2001 attempt at the summit..
Musthag Ata (7550m), Chine(Xingjang), 2003. Mc Kinley (6187m), Alaska, 2004.
polar trekking, between 1990 and 2004. Geographic North Pole (with Didier Goetghebuer), Polar expedition - first Belgians to ever reach the North Pole, on ski and on foot, covering over 760 km, in autonomy, over the Arctic Ocean, 1994. Greenland, polar trek on foot and with parafoils, 620 km, Denmark, 1994 and 1997. 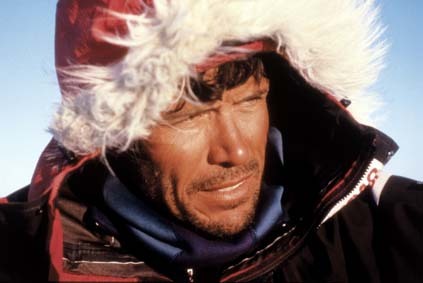 World record crossing of the Antarctic continent, with Dixie Dansercoer, 3924 km in 99 days in autonomy, Antarctica, 1997-1998. The longest crossing ever made on foot and ski, using innovative new power kites. Queen Maud Land, Antarctica - first ever ascent of the south summit of Holtanna (Orvins Mountains) and a dozen of other rock peaks. International expedition, 1999-2000 and 2000-2001. The Arctic - Compaq Pole II- attempt at the longest crossing (over 2400 km) of the Arctic Ocean, in autonomy (the last remaining challenge) with Dixie Dansercoer, spring 2002. The Expedition was forced to abandon because of poor ice conditions.